The Brazilians at Editora Draco publishing house were perhaps the first to believe in Solarpunk back in 2012, first collecting and then publishing nine stories, in January 2013, written by both Brazilians and Portuguese: Solarpunk — Histórias ecológicas e fantásticas em um mundo sustentável. We can’t wait to tell you all about this anthology; we’ll try to contact the editor, science fiction writer Gerson Lodi-Ribeiro, and also try to find out just how much success it has had. 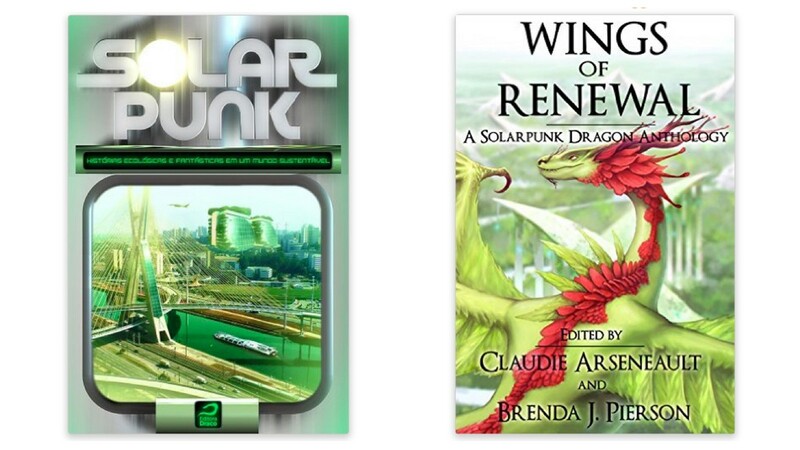 In the United States, the Eco-Fiction website, created in 2013 by writer Mary Woodbury, has been organising a competition since 2014, the Solarpunk Short Stories and Art Contest, which gave birth to the first anthology of twenty-two short stories entitled Wings of Renewal: A Solarpunk Dragon Anthology — published by Incandescent Phoenix Books in 2015 — a second of which will be published next year. In the late spring of 2017, once again in English, Upper Rubber Boot Books in Nashville will be publishing an anthology entitled Sunvault: Stories of Solarpunk & Eco-Speculation, which has been financed through a Kickstarter campaign that raised an incredible 6000 dollars. In France they are at least beginning to ask about it: “Le Solar Punk, qu’est ce que c’est?” (“What is Solarpunk?”; see the 28 September 2015 episode of the podcast Le futur c’est maintenant by Julien Goetz on www.novaplanet.com). In Germany, on www.weltenbau-wissen.de in December 2015, Michael Waning only summarised the characterising features of this new genre, without investigating whether or not there are any existing German texts; it’s worth reading the comments, however, where readers say they are interested in Solarpunk. In Italy, Acheron Books held a writing contest (with a fee) for an anthology of science fiction stories, with scenes and themes that are similar to Solarpunk, created and organised by Davide Mana. Macchina Zero will come out at the end of 2016, in both Italian and English.